The comical play "Iwashi Uri Koi no Hikiami" was written by Mishima Yukio and premiered in November 1954 at the Kabukiza [casting]. This delightful play, one of the few written since the Second World War to find a permanent place in the Kabuki repertoire, is a parody of more traditional plays set in the pleasure quarter. Normally, the hero falls in love with a courtesan, squanders his fortune on her, is disinherited by his family and thereby reduced to penury, faces insurmountable obstacles, and at the end leaves with his lady-love to be united in death by a double suicide; whereas in this play, the hero falls in love with a courtesan, is aided, abetted and showered with money by his father, manages to overcome all obstacles, and at the end leaves with his lady-love to be united with her in marriage. 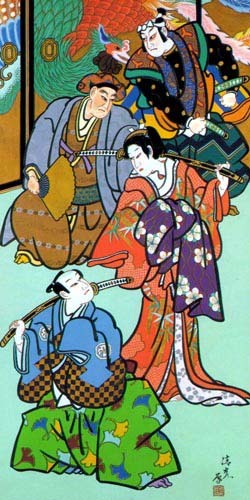 Five of the courtesans are gathered around Tombo, Hotarubi's kamuro. They are trying to guess the contents of a jar which has been given to Hotarubi as a gift. It proves to contain shells, each of which has a verse of a classical poem written on it. The game is to match the first and last verses of the poem, and Hotarubi enters to show them how to play. It's an upper class game, and she is the only one who has played it before. As they play, she notices a strange gardener outside. She thinks she has never seen him before, yet she finds something disturbing about him. Her doubts are interrupted by the Proprietor of the House of Pleasure, entering to tell them to prepare for the anticipated visit of Lord Utsunomiya. The girls leave, and Ebina enters along the hanamichi. He knows the area well - but hasn't been there since he took religious vows. He tells the Proprietor, who is an old acquaintance, that he is the forerunner of Lord Utsunomiya, whom he happened to meet, and proceeds to soften things up for his son's impending visit. Sarugenji, disguised as a somewhat inept feudal lord, arrives complete with horse and spurious retinue. He is bowled over by the beauty of the courtesans - but wants to know which one is Hotarubi, of whose beauty he has heard. Two of the girls both claim to be her, causing some confusion. However, the real Hotarubi enters and takes charge of the situation. She shares some sake with Sarugenji, who is so overcome that he drinks far too much. One of the courtesans, Usugumo, is rather suspicious of this "feudal lord". She claims it is a custom of the House for newcomers to entertain them, and calls for a tale of the brave warrior's deeds in battle. This causes some consternation, but Sarugenji rises to the occasion and, in a parody of a classical monogatari, mimes and recites a battle of the fishes, in which all of the protagonists are fish, with arrows being shot through their fins, and unborn children still being roe in the womb. When Sarugenji wakes, she interrogates him about what he has said. Sarugenji passes off every part of his vendor's spiel as being lines from classical poetry - a subject on which he seems surprisingly well-informed for a sardine seller! Ultimately he manages to convince her that he really is a daimyô - and she bursts into tears. Sarugenji can't understand this, but Hotarubi tells him her story. She is the daughter of the Lord of Tankaku Castle. Some years ago, she heard the call of a sardine seller in the distance, and fell in love with his beautiful voice. Rushing out of the castle, she tried to find him. However, she failed to do so, became lost, and night fell. An apparently kind traveller then offered her assistance - but instead of helping her, he sold her to this House of Pleasure, and she has been here ever since. She had begun to think that fate had returned her sardine seller love to her, but as it seems he truly is a feudal lord, the only way out of her misery is to die. She seizes Sarugenji's sword, but is stopped from killing herself by Sarugenji immediately declaring his real identity. Ebina and the others rush in to confirm his claim. Sarugenji declares she will be his wife that very day, but the Proprietor of the House points out that first she needs to be redeemed with 200 gold pieces. All are pondering this apparently insurmountable problem when Jirota enters. He is a samurai retainer from Tankaku Castle - and was previously seen as the strange gardener, in which disguise he has been trying to find Hotarubi to return her home to her parents. He is leading the fishmongers-disguised-as-retainers, all tied together like convicts. Of course, he has 250 gold pieces with which to redeem Hotarubi, who immediately begins to play the great lady. She orders the fishmongers untied, the remaining 50 pieces of gold to be given to Rokurozaemon in payment for his unsaleable horse, and that she and everyone else learn Sarugenji's sales cry. As she is to be married, she cannot return to Tankaku Castle, since once a girl leaves home to become a bride she can never again return to her parents' house. However, she promises to sell some sardines outside the castle walls so that her parents may see her once again in this way. Jirota is so demoralised that he draws his sword and attempts to kill himself. But his sword has grown so rusty that he is left resolutely alive, and the play ends very happily as Sarugenji and Hotarubi exit along the hanamichi to get married - and to sell sardines. This summary was written by Marion Hudson (April 2010). This play was staged several times during the Shôwa era, with the stars Nakamura Kanzaburô XVII and Nakamura Utaemon VI in the roles of Sarugenji and the Princess. During the Heisei era, the leading roles were successfully taken over by Nakamura Kankurô V (Kanzaburô XVIII) and Bandô Tamasaburô V.